South Korea’s total population rose slightly last year, but elderly people continued to outnumber children amid a rapid aging trend and a record-low birth rate, a national census showed Monday. 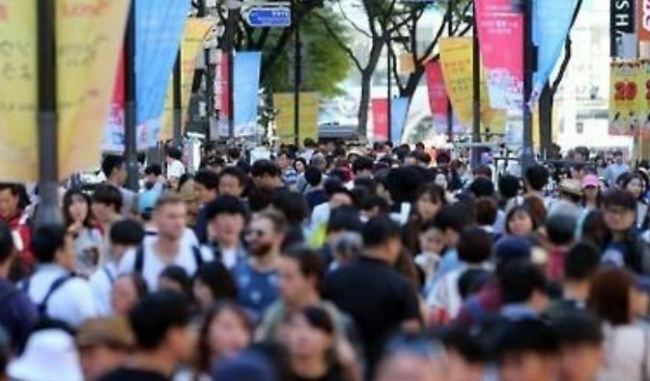 A total of 51.42 million people lived in Korea as of Nov. 1, 2017, up 0.3 percent, or 150,000, from a year earlier, according to the 2017 census by Statistics Korea. The latest annual tally showed the country‘s economically active population falling for the first time ever. The agency has held an annual a census based on national resident registration records since 2016, with conventional person-to-person surveys taking place every five years. The number of Korean nationals reached 49.94 million, while foreign residents who had stayed in the country for at least three months reached 1.48 million, accounting for 2.9 percent of the total. Some 49.6 percent of South Korea’s population, 25.52 million, lived in the capital city area, which covers Seoul, Incheon and Gyeonggi Province. Seoul saw the number of its residents decline 0.6 percent to 9.74 million last year, while the number of people in Gyeonggi Province rose 1.4 percent to 12.85 million. Busan, the country‘s second-largest city, on the southeastern coast, was home to 6.6 percent of the population, or 3.42 million people. The study showed that Korea is rapidly aging, with the portion of the population aged over 65 years rising 5 percent to 7.15 million last year, making up 14.2 percent of all citizens. It marks the second straight year that the number of seniors surpassed that of people in the youth (14 and younger) category, which amounted to 6.63 million in 2017. As a result, Korea’s elderly-child index, which measures the ratio of people over 65 to every 100 children between birth and age 14, stood at 107.3 in 2017, up from 100.1 tallied a year ago. The agency said the surge is attributable to the country‘s rapidly aging population, coupled with a low birthrate, which fell to a seven-year low in 2017. The data also showed that the country’s economically active population contracted last year. The number of people in the age group reached 36.2 million last year, accounting for 72.5 percent of the total. In 2016, that population amounted to 36.3 million, or 72.8 percent of the total, they showed. There were a total of 20.16 million households in the country last year, up 1.7 percent from a year earlier, with an average of 2.47 members. One-member households were the main family type in 2017, accounting for 28.6 percent of the total, while the typical four-member family accounted for 17.7 percent. Nearly half of Korean families reside in apartments, with 9.67 million households, followed by 33.3 percent living in detached houses.